You will be welcomed by our representative at the airport on arrival and assisted with your transfer to a hotel in Negombo for relaxation. After an early breakfast, you will leave for Anuradhapura, an ancient capital of Sri Lanka. You will see a rich collection of archaeological and architectural wonders in this historic town. There is much to see in Anuradhapura. Most renowned and venerated is the sacred Bodhi tree which is perhaps the oldest living tree in the world. There are 8 major palaces, monasteries and monuments to explore. Polonnaruwa became the second capital of Sri Lanka after the destruction of Anuradhapura in 993. You will be exploring beautiful ancient palaces,temples, stupas and a large statue of a reclining Buddha. Cave Temple, which houses paintings and ancient Buddha Statues. This is a fascinating place to visit. Rising from the central plains you will see the world famous rock fortress of Sigiriya. This is a must visit site. The climb to the summit is a bit strenuous but the climb is worth it. After an early breakfast continue your journey to the historic hill town of Kandy, a picturesque city fascinating in climate and landscape, with a rich cultural heritage. The sacred temple and Botanical gardens at Peradeniya are important sites to visit. An optional cultural show in the evening ends with a thrilling fire walking ceremony. Today you will take a scenic train ride to the cool and salubrious town of Bandarwela. Located in the misty mountains amidst lush green tea plantations you can taste real Sri Lankan cuisine. After breakfast, take a hike through a tea plantation. You will pass small settlements and humble homesteads, where life is very simple amongst the dwellers. You will be travelling to Haputale, a small town in the Badulla district at an elevation of 1431m. This town has a rich bio-diversity dense with numerous varieties of flora and fauna. Today you will journey down south to the beach town of Mirissa en route stopping at an elephant rehabilitation centre where you will see injured elephants being cared for. After breakfast , visit the turtle hatchery in Mirissa ( An organization which takes good care of baby turtles to promote the sustainment of sea turtles). You can partake at your own volition at water sports activities in Mirissa. 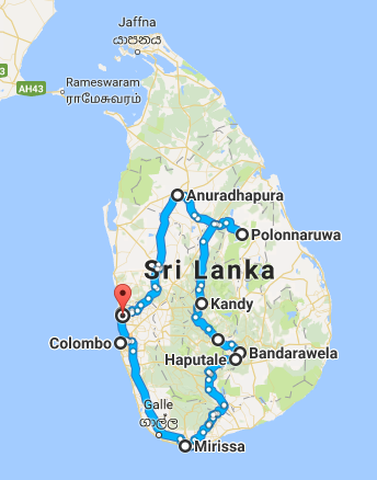 The travel route on this day is a coastal journey which offers spectacular views along the way to the historic portuguese and Dutch town of Galle. Galle is the administrative capital of Southern Sri Lanka. Predominantly known to tourists as a must see town. An evening walk along the ramparts to watch the sunset will be very relaxing task after your long journey. After Breakfast, you will be Travelling to Colombo, the capital of Sri Lanka, which has a long history, serving as an useful port during ancient east-west trade routes. Colombo was ruled for 4 centuries by the Portuguese, Dutch and British colonialists. Night life is busy in this cosmopolitan town and there is plenty to see and do in Colombo. After a 15-day tour around some of the magnificent locations of Sri Lanka, your holiday ends today. ​Your chauffeur will drop you at the airport in time to catch your departing flight after you have checked out of your hotel. ​We wish you a pleasant journey back home. ​Please do recommend Leisure World Tours to your friends and family. Cheers!